With a choice of designs, wall or basin mounting, and a reduced flow rate of six liters per minute, GROHE electronic basin faucets combine style with practical features. Perfect for luxury hotels, bars and restaurants, two recent additions to our range – Allure E and Essence E – bring designer appeal to our range of electronic faucets. For maximum hygiene, it is also possible to program regular automatic flushing one to three days after the last usage to avoid water stagnation – an important feature for facilities that are not used on a daily basis. 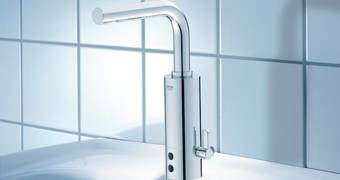 Both digital faucets and electronic faucets are naturally water efficient. 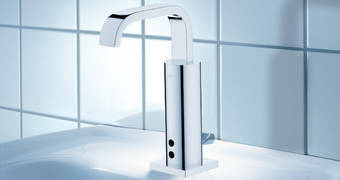 With infrared electronic faucets the water stops when the user moves away from the faucet. 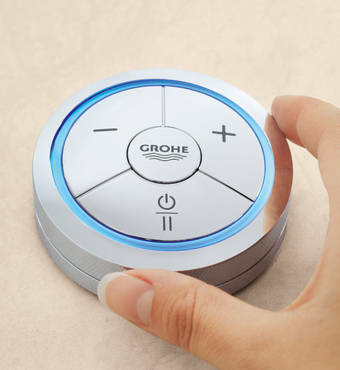 GROHE Ondus® digital and Veris F-digital faucets feature a range of benefits including programmable features and a 'Pause' button. Features such as teeth brushing can be pre-programmed to ensure maximum water efficiency. Tap the icon and the water will start for a few seconds for you to rinse the brush, the water then stops and will resume after your pre-selected time.